Sunrisers Hyderabad opener Jonny Bairstow was in the mood for some fun and games ahead of their fixture against KXIP as he was seen playing a prank on Kane Williamson. 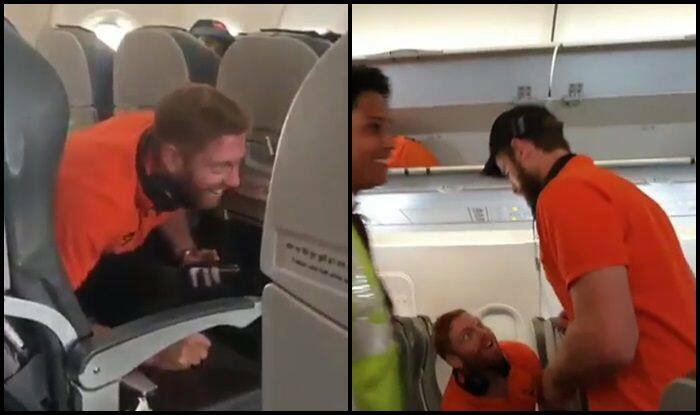 Ahead of their clash against Kings XI Punjab (KXIP), Sunrisers Hyderabad opener Jonny Bairstow was seen engaging in light-hearted banter with the flight staff and his colleague Kane Williamson. Bairstow was playing a prank on the people who crossed his seat through the aisle of the flight while he ducked only to score them when they passed through him. The hilarious incident was shared on the Sunrisers Hyderabad social media handle and has been going viral on the internet. Although all the fun will be halted for some serious affair when the David Warner-led Hyderabad side takes to the field against Kings XI Punjab at the I.S. Bindra Stadium in Mohali on Monday. Having had a bitter-sweet campaign so far, both the sides will aim to get back to winning ways. In their previous match, Kings XI Punjab had visited defending champions Chennai Super Kings and were defeat in the fixture which took place at the Chepauk stadium. SRH were looking on a roll after the loss in their first game in Kolkata before Mumbai Indians (MI) pacer Alzarri Joseph halted them in their own home ground on Saturday.